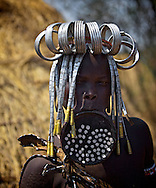 The Mursi of Ethiopia is a fascinating tribe. 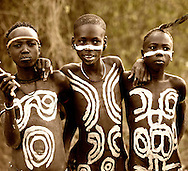 They live in the beautiful Omo Valley, in one of the most isolated regions of Ethiopia. Their habitat is an extremely hard-to-reach area between the rivers of Mago and Omo. The main occupation of Mursi is cattle-keeping although they have now started on crop farming. 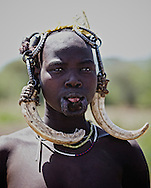 The tribe still sticks to their traditional and unique culture by donning traditional dress and accessories. They have also stuck to conducting barter trade. They are known to wear skins, put on wild headgear and paint their faces. 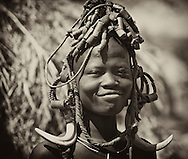 One thing that stands out in this community is how the Mursi women wear clay or wooden plates in their lower lips or earlobes. They start wearing the lip-plates when they are around 15 to 16 years since it is also an expression that a woman has reached child-bearing age.